Two teams atop a pair of surprisingly weak divisions. 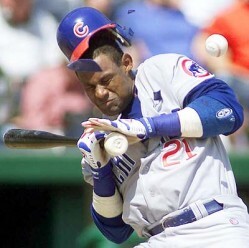 A Cubs team dodging bullet after bullet from everyone they’d most likely face in October. A Sox team built to win the AL Central by default. A local media licking its chops over the prospect of becoming doubly important in times of accelerating irrelevance. Wildly irresponsible and premature World Series hopes aside, could this be the lamest Cubs-Sox series since the advent of interleague play? Lest anyone think I, admittedly petty and militant Sox fan that I am, would try pleading ignorance to what may be a very important year on the North Side, we’ll get one thing out in the open before I continue: the 2008 Cubs are a very good team. Solid pitching and a killer lineup are undeniable, even if they are wearing enemy colors. I do not begrudge them their success, nor do I think some stupid curse will be their undoing (my money’s on things going downhill after Carlos Zambrano murders Fonzie on national television for bobbling one in left to cough up a slim lead over the Phillies in the NLCS opener). The problem is, there isn’t really as much on the line for us as Sox fans anymore. Sure, we still hate the Cubs and sure, wins are great when we can get them. But once the Good Guys scored four touchdowns in a single game finally won the World Series, six games against a team from another division suddenly don’t carry as much weight. We’ve learned how to think big [insert joke about Sox fan cognitive capacity here] and how to look down the road far beyond what happens across town, even if that road leads to the disgrace that was the second half of 2006 or the entireties of 1998, 1999, 2001, 2002, 2003, 2004, and 2007. Someday in the hopefully distant future I will be sitting at a table in some dive bar, possibly near the corner of 55th and Cicero. My friends and I will be discussing the Sox game about to start, and will no doubt be making ridiculous, delusional, Superfans-style prognostications about why the Good Guys are about to steamroll the opposition by virtue of having captured that one title in our lifetime in epic fashion. We’ll get all misty-eyed, clinging to the nostalgia of the group that scored four touchdowns in a single game won it all, oblivious to the absolute nothing that has happened in the years since. If a busload of White Sox were to enter the Indianapolis 500, could they beat Scott Dixon? What if Ozzie were driving the bus? Hey Denise, look at this! Loomis Street, 2005. 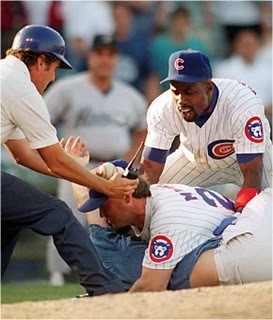 I was kicked by a cop’s horse, trying to put an Aaron Rowand jersey on him. Don’t let it happen to you, Cubs fans. Losing forever is the only way to keep hope, dignity and self-respect alive. Trust me on this one. Strangely enough (we’ll call it the Scammy Paradox), there’s actually more for the outside observer to dislike about the Cubs now than there has been since you-know-who was run out of town by the same field-polluting, baseball-throwing, bad-word-using people who made him their god. Zambrano’s first-inning strikeout fist pumps and fourth inning base-on-balls tantrums. Fonzie’s moonwalks turning his home runs into doubles. 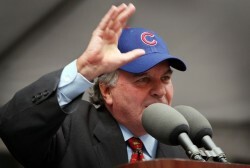 Lou Piniella’s calls for “Cubbie Swagger,” a battle mantra as laughably weak as “cloud shanking” or “goldfish streetfight.” Ron Santo chiding Jose Valderde as a “hot dog” and “weasel” for his on-field antics even though Santo made himself famous with that little jig down the third base line after Cubs wins during the magical second-place finish he so bravely led the team to back in the summer of ’69. And that’s not even counting the hilarious crookedness off the field, what with the proposed TIF districts and the non-recusive editorial recusion and preemptive TV contracts and whatnot. Sometimes the whole thing borders on obscene. Cubs: Derrek Lee is a great player and likely one of the nicest dudes in the world, and his charity work is highly commendable. No one can get mad at that. MetaCubs: Two of the three most newsworthy Cubs fans of this decade made headlines for going after an umpire and a Royals coach, respectively, at Sox games; the third became the most reviled figure in Cubdom for doing what Moises Alou couldn’t. Cubs: Cartwheels and self-aggrandization aside, Carlos Zambrano is one of the best pitchers in the game. Not in the division, not in the league, but in the world, and any team would be fortunate to have him on their staff. MetaCubs: Pure customer-hating evil summed up in five simple words: Wrigley Field Premium Ticket Services. Cubs: If Kerry Wood can actually hold up and hold on, he and Carlos Marmol may just form the best setup/closer combo in the sport since Mariano Rivera and John Wetteland. MetaCubs: Will the title of “baseball’s best neighborhood” transfer cleanly to the outskirts of Naperville? And on and on it goes. You get the idea, but I have a feeling you’ve probably heard it all before. Of course these things have almost nothing to do with the series at hand, which is why none of it will bear effect on the Sox taking two of three this weekend. You might find it ridiculous that I just spent the space of 700 words praising the Cubs only to predict their downfall in round one against the White Sox, but two things say I’m right about this. For one, the Sox miss Carlos Zambrano’s turn in the rotation and only a fool would concede anything to the pitching heroics of either Ted Lilly or Jason Marquis. A fool, or perhaps Hawk Harrelson should Lilly shut down the Sox. For another, the Sox are sans Paulie this time around. This would normally be a problem, but that .215 average and .322 OBP weren’t worth counting on to deliver. Not this year anyway, and with Konerko sidelined the Sox are down to a totally reasonable two starters with batting averages less than Juan Uribe’s weight. Because, you know, three would just be ridiculous. But I could be wrong, and often am about such things. Such is life. Believe me, I want nothing more than to get worked up about the latest chapter in this city’s endless civil war. I want to dance with joy over every Cubs failure and sing to the skies above with every Sox success. I want to quench some kind of innate bloodthirst vicariously through the brutalization of the Small Bears at the hands of the Pale Hose. But the Sox right now, they’re not really worth singing about, at least not in any well-rounded, fundamentally sound, fear-no-team way. And until the Cubs or Bulls or Bears or Hawks do something about it, these So-So Sox are still the last champion standing in this city. And that, my friends, is just about the saddest thing we – you, me, all of us – have going for ourselves. So yeah, mark it down: White Sox 74, Cubs 2. After all, our civic pride is on the line.